The day of Ukrainian Christmas Eve is a fasting day, thus no meat is consumed at all, and all the meals are small, and very simple. Some people abstain from eating all-together for the whole day, until the first star appears, and a 12 course meatless meal is being served for the whole family, to break the fast. My mother did not use any shortening for Christmas Eve meal preparations, but rather a very fresh flax seed oil, which she had made especially the week before Christmas. I loved the flavor of the fresh flax seed oil in all the meatless dishes. I have been searching for good flax seed oil, and the Spectrum Organic Flax Seed Oil (above) comes closest to my recollection of my mom’s flax seed oil. One of the 12 course meatless dishes served during a Ukrainian Christmas Eve, is a Traditional Ukrainian Borscht (Red Beet Soup). 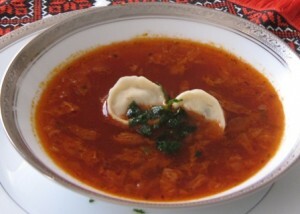 I serve this borscht with homemade vushka (mushroom dumplings), or mushroom tortellini, cooked according to package directions. This is my favorite meatless borscht recipe for Christmas Eve, but any other time of the year, I use chicken or beef broth as the base. Saute 1 chopped onion in 2 Tbs oil until golden. Add shredded beats, carrot and celery. Cook for about 10 min. Add to the boiling water or soup stock. Add whole onion, bay leaf , peppercorns. Bring to boil again and simmer for 20 min. Simmer for another 15 minutes, or until cabbage is done. Remove the whole onion , bay leaf and peppercorns. Add chopped dill (for a more tangy flavor, you may add more vinegar, 1 tsp at a time). You may add another 1 Tbs of flax seed oil to the finished borscht, if you feel it needs more flavor. I also add a couple of dried mushrooms into the borscht at the beginning of cooking time, and remove them at the end, for additional flavor. You may remove half of the cooked veggies from the cooked borscht, process them in the food processor, then add 1/2 of the mixture back to the borscht, for additional texture. If you prefer clear borscht, you may remove all the veggies, puree them and save them for later use to make a batch of "quick borscht" by adding several cups of soup stock to the puree, and bringing it to boil. I still have dried mushrooms from Europe, so I use them in my borscht, and add them to my vushka. It definitely adds special flavor to the borscht. If you decide to use dried mushrooms, you need to simmer 1 oz of dried mushrooms in 3 cups of water, for an hour. I also soak my dried mushrooms overnight in 1 cup of water, and use that water for cooking them. Once cooked, strain the mushrooms through a cheesecloth, or coffee filter, save the mushroom broth to add to the borscht during the last 10 minutes of cooking. Chop the mushrooms very finely to use for vushka filling. If you do not make vushka, you can discard the mushrooms, or chop them up to serve with the borscht . Serve with homemade vushka (mushroom dumplings, pictured above), or mushroom tortellini, cooked according to package directions. To make vushka, you may follow my varenyky (pierogi) recipe for the dough, but cut the recipe in half, and use a much smaller cutter (2 inch in diameter – a shot glass is perfect for this). 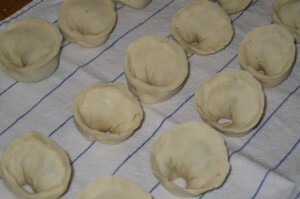 Once you seal in the filling, then wrap the varenyky around your index finger, and pinch the ends together, to form a vushko (ear like shape). Use 1 Tbs of vegetable or flax seed oil, to saute 1/2 onion, chopped. Add the chopped mushrooms, or saute 1/2 cup of finely chopped fresh mushrooms, until all the liquid is cooked out. Remove from heat, and mix in 1 Tbs of flavored bread crumbs, to hold the mixture together, for easier handling. I may have asked, but did the grandkids sit with Santa?! Your wedding posts are just breathtaking. What a great service you are doing to all the young ladies who are searching for ideas. My granddaughter did not warm up to Santa, so she did not wish to sit on his lap…maybe next year. This Ukee recipe looks great too! If I wanted to look this borscht as the meat version do I just use 6 cups of chicken or beef stock instead of 6 cups water or vege stock? or will you be posting another borscht with meat in the future? You are such a great cook!!!! I love the meatless borscht so much, that I always cook it this way, not just for Christmas. If you like the meat stock, then you can make your own broth from chicken or beef, or pork, and follow the rest of the recipe as is. For a quick borscht you can use ready made broth. Cooking is easier than baking, because you can change the recipe to your own taste, and still have great results. I am looking forward to more of your yummo recipes in the future. Oh, I know what you mean. Since I love trying new recipes, as well as recreating old ones, some of them are not much to brag about…..lol I only post the ones that I like and my family enjoys as well.